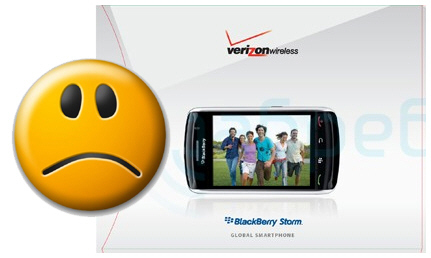 Verizon BlackBerry Storm 9530 Announcement Video!! Update 3: Oh Verizon. We know you'll soon launch the BlackBerry Storm's info site at www.verizonwireless.com/storm, but in the meantime it would have been nice of you to let us keep up the announcement video we posted. After all, it seemed your whole goal with Monday's Minute with Mike announcement was to capitalize on the blogosphere hype. Why spend so much time and effort producing a snazyy video that you don't want leaked out everywhere?! Big Red, we were helping you out. Ahh well...all good things must come to an end....one door closes, another opens and all that jazz. Read On for BlackBerry Storm info and lots of comments. Since a picture is worth a thousand words and a video is worth even more, we'll do the opposite and just quickly summarize the key info regarding Verizon's upcoming BlackBerry Storm touchscreen smartphone that was relayed by Mike Lanman, Chief Marketing Officer of Verizon Wireless, in the Monday, September 15th Special Edition episode of A Minute with Mike. Pricing and availability of Verizon's BlackBerry Storm have not been disclosed yet, but the company will be launching a site in the near future at www.verizonwireless.com/storm where you can sign up for updates and news surrounding the release of the BlackBerry Storm. We'll let you know when Verizon launches the new site. Take a read through the comments below for reactions to the now-pulled video. Thanks for tuning in...and stay tuned for more! Update 2: Well, it appears the powers-that-be weren't to fond of that video, it's been yanked from YouTube. Actually, I find it a little odd that it was taken down. If you check out the "Talking Points" .pdf after the jump the whole document is geared towards the hype surrounding the Storm in the Blogosphere. Well, We're going to continue to talk up the Storm, guys, pulling the video from YouTube only serves as confirmation. Here's that video, one more time, with feeling! Here it is BlackBerry Nation! You've been waiting all day for it. BIG THANKS to the crew who got us a video capture of the Verizon BlackBerry Storm 9530 announcement video that went out to VZW employees this morning on the Minute with Mike show. The sound quality isn't great, but it features captions so its all good. Don't forget where you saw it first!